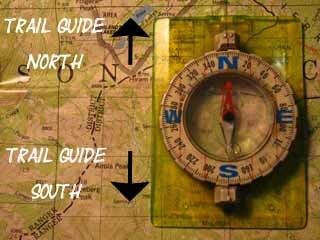 This trail guide index page below gives us the information for continuing our hike South, back through the Happy Isles JMT Trailhead in Yosemite Valley, back to the Southbound John Muir Trail in Lyell Canyon by an alternative route. Our goals are both to explore as much new terrain along our trip down to and back from the Valley as possible while positioning ourselves up as well as possible to continue our long hike South on the JMT-PCT along the Sierra Crestline. I figure that goal means returning to a point as close to where we turned off the Sierra Crest for the hike down to Yosemite Valley as possible. That point for me is generally the center of Tuolumne Meadows located at the TM Post Office. From Voglesang High Sierra Camp we have a choice between hiking Northwest from Voglesang through Tuolumne Pass to the federal facilities at TM, or we can hike to our Northeast down into Lyell Canyon to pick up our Southbound JMT-PCT routes 5.6 miles South of Tuolumne Meadows. We can loop back to Tuolumne Meadows or drop into Lyell Canyon. So, this next section of trail indexed below brings us from Yosemite Valley back up to the Sierra Crest. This section is the return and final leg of our Golden Triangle alternative route. That brings up some good questions. How long is the Golden Triangle, and how many feet of ascending and descending are we doing from beginning to end? Let's review some of the available data along the trails, then refer to our own, "onsite" Tahoe to Whitney Trail Miles. We should be able to derive some "in the ballpark" figures between the former and latter sources of mileage information. I have 25.94 miles from Yosemite Valley to the JMT in Lyell Canyon. I have 21.8 miles from Tuolumne Meadows to Yosemite Valley along the Standard JMT. That totals out to 47.74 miles without accounting for the distance from the TM Post Office out to the trail leading up to Vogelsang in Lyell Canyon, which would close the loop in Tuolumne Meadows. 27.5 miles from the Lyell Canyon trail sign at Lyell Canyon Trailhead on the Southeast edge of Tuolumne Meadows. The trail sign pictured below at Happy Isles cites the miles from there to Tuolumne Meadows at 27.3 miles along what I imagine is the route up the Merced River, and I believe the 27.3 figure includes the hike over Vogelsang Pass as well as the distance from the JMT trail junction in Lyell Canyon North to Tuolumne Meadows Lodge. That would make The Golden Triangle 54.8 miles in length from Tuolumne Meadows back to Tuolumne Meadows. This distance can be reduced by 5.6 miles if we measure the Golden Triangle from Yosemite Valley to where we resume the JMT in Lyell Canyon. Thus the Golden Triangle adds in the neighborhood of 49.2 miles to the length of our Tahoe to Whitney backpacking trip, and likely around 4000 extra feet of climbing. None of these measurements can possibly account for the vast range of cool folks met and befriended, the many animals encountered, and the unique social and physical realities that characterizes Yosemite Valley and the Central Yosemite Wilderness wrapping around it. 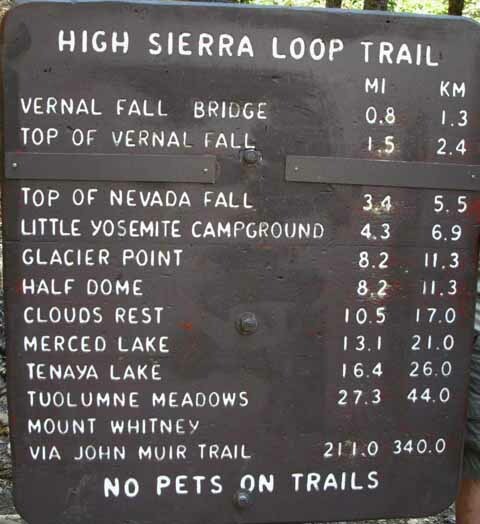 Trail miles sign at the Happy Isles Trailhead of the John Muir Trail. This is the guide index page for the second leg of an amazing alternative route off of the High Sierra Crestline between Lake Tahoe and Mount Whitney that I call "The Golden Triangle." Though we walk most of the JMT on our route along the Sierra Crestline hiking from Lake Tahoe to Mount Whitney, we miss the beginning of the JMT in Yosemite Valley. In fact, our "standard" route along the Sierra Crestline stays up high and goes around the whole Merced Drainage and Yosemite Valley at its center. We have fixed that "slight" omission by adding the "Golden Triangle" leg from Tuolumne Meadows down to Yosemite Valley along our Tahoe to Whitney backpacking trip. Why not? This index covers our next section of trail bringing us up from Yosemite Valley back to the John Muir Trail in Lyell Canyon, but by a different route than the John Muir Trail route we followed down from Tuolumne Meadows. Our return hike will begin through Happy Isles with the JMT, but we turn off the JMT at Little Yosemite following the Merced River up to Merced Lake, where we turn to hike over Voglesang Pass. Our hiking map of Tuolumne Meadows shows the beginning of the JMT "Golden Triangle" route down to Yosemite Valley and the end of our Golden Triangle route over Voglesang Pass. The Central Yosemite Map fills in the gap between these points. The Golden Triangle ends where we reengage the Southbound JMT in Lyell Canyon to continue our Southbound hike on the JMT down the Sierra Crest to the Whitney Portal. This index provides information about the hike from Tuolumne Meadows down to Yosemite Valley. The next index covers the hike from The Valley to the JMT in Lyell Canyon. Post up your experiences, information, and your questions and comments about backpacking into and out of Yosemite Valley. THIS PAGE IS UNDER CONSTRUCTION: STAY TUNED FOR MUCH MORE! COME ON BACK NOW, 'YA HEAR? Have a great trip or story to relate about Yosemite or in the Sierra Nevada? A fine piece of gear? Or gear that failed? An excellent backpacking tip? The Trails Forum acts as your place to put up input, comments, relate your experiences, or ask questions about each segment and spot along the length of our combined TYT-PCT-JMT trails. The Forum is your place to supplement the trail guide. Anyone can post text comments in the existing forums, but only members can post up new topics, along with images, maps, and formatting.